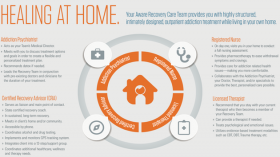 What Are Inpatient Addiction Treatment Centers? If you or someone you love is struggling with drug or alcohol addiction, you may need to find an inpatient drug rehab center. Inpatient drug rehabilitation centers can give you the intensive therapy and tools to manage alcohol and drug addiction so you can get back on the right path and live a successful, happy and productive life. Inpatient treatment centers give you the opportunity to live with other people who are struggling with drug or alcohol addiction while getting the help you need to recover from your addiction. Residential drug and alcohol rehabs provide 24/7 supervision and care while you reside at the center for the duration of the program. Hospital-based inpatient facilities offer around-the-clock medical care from healthcare professionals. Many non-hospital-based residential programs also facilitate access to medical services when needed. 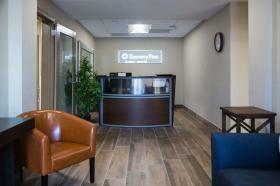 At most inpatient centers, you'll participate in group therapy on a daily basis. In many cases, you may also attend individual therapy sessions and 12-step meetings. Support group meetings offer peer support and recovery advice as you begin to work the steps with others in similar addiction situations. Some residential programs may host alternative, non-12-step support group meetings. For more information on the difference between 12-step and non-12-step support groups, read here. A 5-minute Call Can Change Your Life. Call today to find a program that can get you on the road to recovery. Different inpatient rehab centers will vary in terms of their treatment offerings and other program details. The length of the rehab program, for example, may vary across different residential drug and alcohol rehab centers. Some programs are as short as 30 days, while other programs can last up to a year. Inpatient centers also vary in terms of autonomy. Some rehabs operate closed treatment campuses in which you must stay at the center for the entire program duration and cannot have visitors. Other programs allow you to come and go as you please, with fewer restrictions on visitors. 1. What types of addictions does the facility treat? If problematic drinking is your main issue, you might want to enter a program with extensive alcohol rehabilitation experience and the ability to safely manage alcohol withdrawal. Different drugs may also require different types of help. For example, a prescription opioid addiction may benefit from specific medical detox interventions and other considerations that other forms of substance dependence don't require. 2. Is the program geared towards any specific group of individuals? Some inpatient drug rehab centers are designed specifically for high-level executives, for women, or for LGBT individuals. Other programs have more diverse patient populations. If you have special treatment requirements or simply think your recovery experience will benefit from treatment details tailored to a particular community, you might want to choose a residential treatment center that caters to your particular demographic. Luxury inpatient facilities, for example, will seem more like resorts than clinical settings. They offer a wide range of extra services and amenities that can include acupuncture, equine therapy, golf ranges and spa treatments. Depending on your needs and income level, you might want to consider these facilities to make your stay more comfortable. 4. What types of treatment are available? Most inpatient drug rehabilitation centers offer both group and individual therapy and counseling. Different types of therapeutic interventions may be available, depending on the type of center you go to. Do you want to attend a program, for example, that also requires family members to attend therapy sessions? Is the inpatient facility at a hospital where you can receive 24/7 access to professional medical services? Also consider if you will be needing a facility that is equipped to care for any concurrent medical or mental health conditions you may have—i.e., a dual diagnosis treatment center. 5. Do you need to maintain an active presence at your place of work during residential rehab? If so, consider exploring an executive rehab center, where you will be able to receive quality inpatient care while still tending to your daily work responsibilities. 6. Do the program costs work for your budget and insurance? The price of inpatient programs varies, depending on the location, amenities provided, type and length of the program. So it's important to find out if and how much your insurance will cover for you. If the price is still out of your range, speak with someone at the program who can walk you through some additional payment options, should they be available. In addition to less expensive outpatient programs, there may be inpatient programs available to you that offer sliding scale payment options or financing plans. Use Our Contact Form if you or someone you know is searching for a residential inpatient rehab facility and needs help sorting through the options. Some of your costs may be covered by insurance. Check with your insurance company to find out whether you can be reimbursed for the cost of rehabilitation. Anyone can call a helpline or treatment center directly to speak with a nonjudgmental admissions consultant. In order to get the most out of your call, you’ll want to prepare a list of items to report to the person who answers the hotline. First, have your insurance card available. This card will provide the insurance company name, policy number, and type of plan. Different rehabs accept different types of insurance plans, so it’s important that you find a facility that will accept yours. It’s also helpful to inform the admissions consultant about what types of drugs are being abused, how long the drug abuse has been going on, and how severe the addiction has gotten. It can also be beneficial to provide them with information regarding previous treatment or withdrawal experiences, medical concerns or limitations, special population considerations, and any co-occurring mental health disorders. Treatment programs vary greatly, and some will have experience in addressing your individual needs. Inpatient drug rehabilitation centers are required by law to have confidentiality policies in place. Your treatment is considered medical treatment—nobody but you, your doctors and others directly involved in your treatment plan have the right to know about it. When work-related duties are keeping you from seeking the substance abuse treatment help they need, executive rehab centers could be a convenient solution. Executive rehab centers combine top-rated drug abuse treatments with the ability to simultaneously maintain an active presence at work. Luxury addiction treatment clinics furnish the top-shelf amenities you would expect to enjoy only in the nation's best hotels, with your recovery and comfort both taking top priority. From housekeeping services and in-house massage therapy to gym facilities and nutritionist consultations, you can receive high quality addiction treatment while pampering yourself with plush amenities. If you are ready to enter rehab and reclaim your life from a drug or alcohol addiction, call our helpline. We can answer any questions you have about residential drug rehab centers and connect you with an inpatient treatment program that can address your addiction issue. It's important to take your time so you find the inpatient residential drug rehabilitation program that is most likely to help you achieve sobriety. No matter what addiction you are struggling with, you can overcome it with the right kind of help. 1. American Addiction Centers. (2017). 2. U.S. Department of Health & Human Services. (2013). Summary of the HIPAA Privacy Rule.